This is a very simple, form-hugging T-shirt, long enough to work as a beach cover-up, and perfect with leggings, jeans and shorts. It was sent to me for evaluation, and I am happy to give it my thumbs-up for comfort, classic styling and usefulness. Like other Meaneor tops, it is made of a lightweight, stretchy cotton blend with a good proportion of synthetic fibre for an elastic, close fit. It reminds me of Lycra or Spandex, the sort of thing that makes activewear so comfortable. 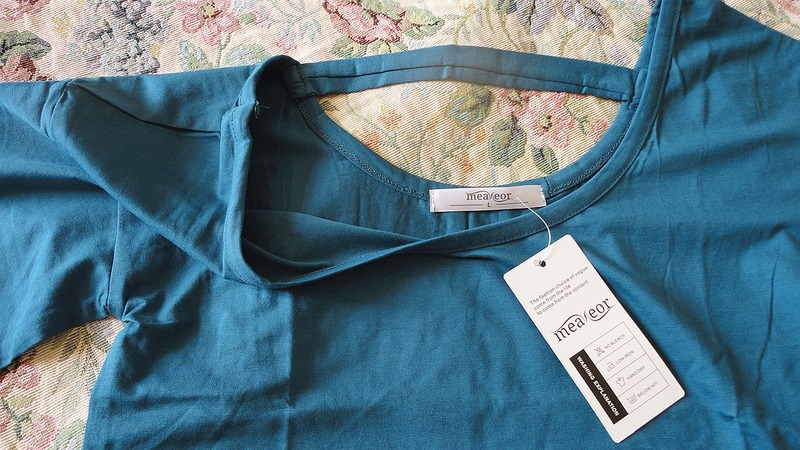 Whatever it is, the top is very silky and lovely to wear, and very easy to wash. Care instructions from the label: Wash below 40°C, hang to dry, low iron, no bleach. I washed it at delicate setting, and put it on a hanger. It dried quickly and, for my purposes, does not require any ironing, so a very unfussy garment for casual wear. It is available in some vivid solid colours. In my photos you see the Blue. I love this sophisticated petrol shade that goes well with jeans and many other summer colours. Other choices are black, white, grey, watermelon red and mint green. With this brand, I find that Medium usually fits me but for this one, I asked for Large to test a different size option (I usually take a UK size 10, US size 8). I'm really happy with the way it fits, a little looser and longer in length and sleeve. The rounded scoop of the neckline at the front is mirrored in the back, with a simple detail (a strap that spans the opening) to make it a little bit different. Stitching and manufacture are more than adequate for an unpretentious summer top. You can check out the details in my close-up photos. Shapely and pretty, the sort of thing one can wear all summer long. 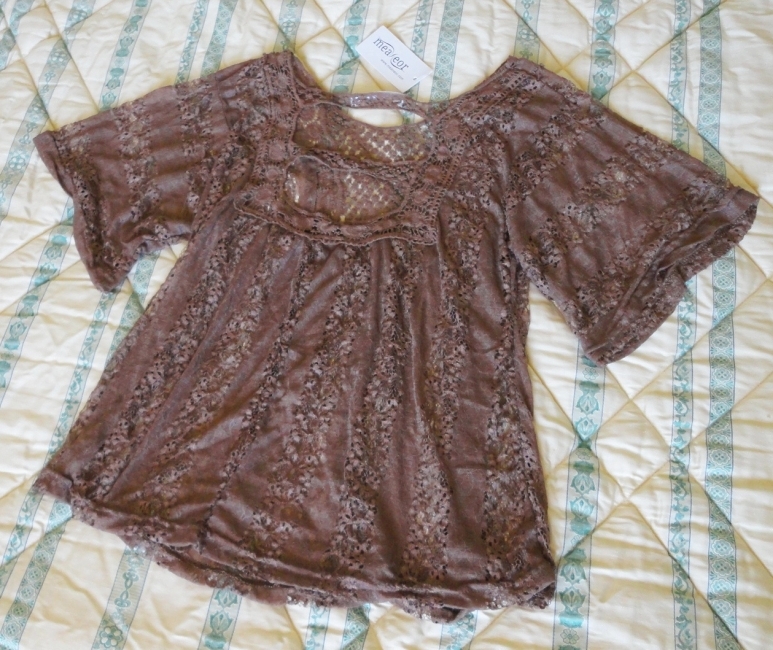 This quirky top instantly appealed to my flower-power soul. I was offered a sample for an independent evaluation and review, and it was difficult to choose a colour. I really liked the Cream one, but in some photos it had a pink cast so, to be on the safe side, I asked for the Coffee which turned out to be a lovely soft shade of caramel brown. I'm hoping that it will look equally good on pale, wintry skin as it does on a tan. Straight out of the storage bag, the top had a lot of loose threads so I had to snip those off before trying it on. It is a rather delicate garment and weighs next to nothing. The main fabric of bodice and sleeves is made of very loosely woven lace anchored by a very open crocheted square over the decollete while the crochet work at the back features two large openings. As a multiple cat owner, I view this as a highly snaggable top. 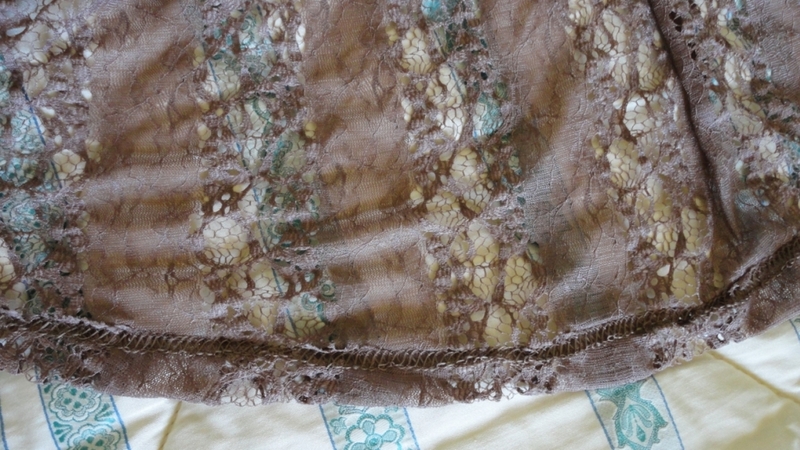 But then again, it's got so many holes already, one more would not really be noticeable! Because it's so obviously sheer, I like to wear this as an embellishment over a plain tank top or bandeau bra rather than mess around with invisible bras. That way it is very versatile because you will get a different look depending on what you wear underneath. Pairing it with white or cream is always classy but it can look quite interesting over a dark colour, like black, green or midnight blue. Since the top is available in many other colours, there are lots of possible combinations. I could also see this over a form-fitting plain bodysuit, or over leggings, jeans and many types of trousers. The other obvious way to wear this is as a swimsuit cover-up, although it's not really long enough on its own, and might need a pair of shorts. I haven't washed it yet, but I can see this as being a careful hand-wash exercise followed by drip-drying. Now the thorny issue of what size to order: my usual size is a UK 10, US 8, and French 38. So far a Meaneor Medium has been perfect for tops and dresses, although with trousers it's more like an XL. It sounds bizarre, but that's been my experience. I have this top in a size Large and I think it's the perfect size for me. 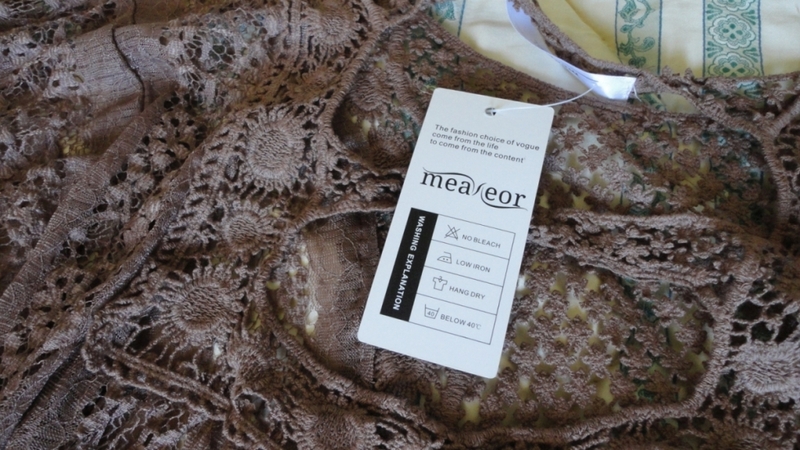 So if you fancy this lovely lacy top, you can trust the size chart. I think it's beautiful and so nice to wear. To paraphrase the famous saying, it's prettier than a picture. Because of the shape at the back, I find that a sports bra works best, or a bra with adjustable straps, set in the criss-cross position. Despite the low price, the quality of manufacture is very good. You can see details of the stitching and internal finishing in my close-up photo. I have washed this top in cool water at the hand-wash setting of my washing machine, with low spin. It came out great (no noticeable shrinkage or colour loss), and all it needed was to be left to drip-dry on a hanger. The fabric is a cotton blend with a fair amount of synthetic in the mix. 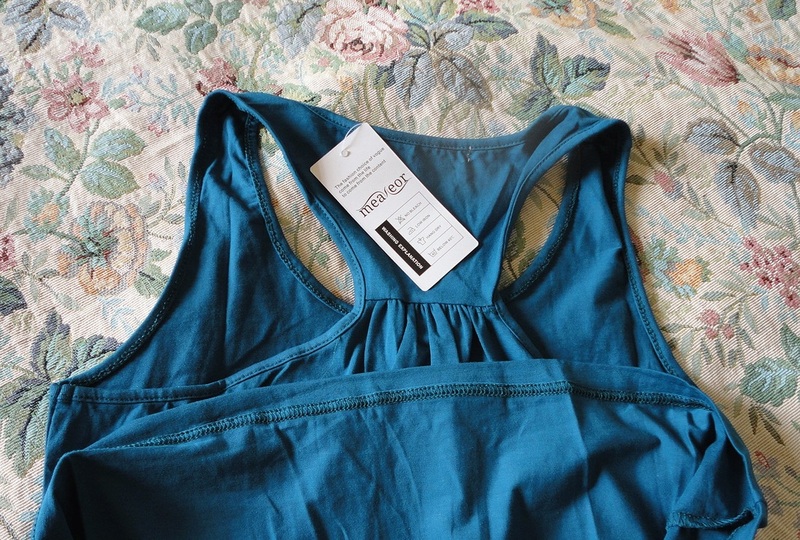 Here's what the care tag says: Wash below 40°C, hang to dry, low iron, no bleach. A shape-enhancing little tank top to wear every day. Well cut with a bit of waist shaping, and a little gathered detail at the back giving some personality to an otherwise very simple tank top. The length is such that it just skims the hips, perfect over jeans, leggings, shorts and summer skirts. The colour choice consists of strong, solid colours: white, coral-red, mint green, black, steel grey and this lovely petrol blue. It's a review item which I am happy to have been offered, as you can never have too many summer tops. 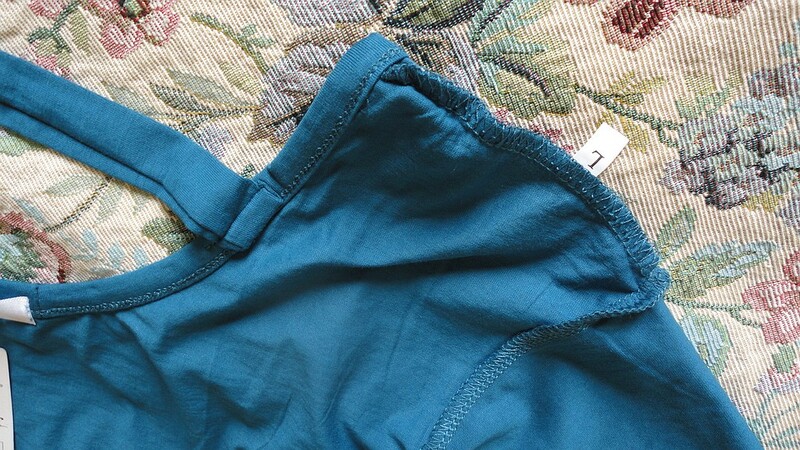 Unless you like your clothes fairly loose, there is no need to size up with this brand. The size chart is accurate and the fabric very elastic. I usually take a UK size 10, US size 8; for my bust measurement, I could have gone for a Large, but I asked for a size Medium and it fits beautifully, like a second skin.